A few projects on the go. I finally put the last stitch in the Dresden du Jour quilt. 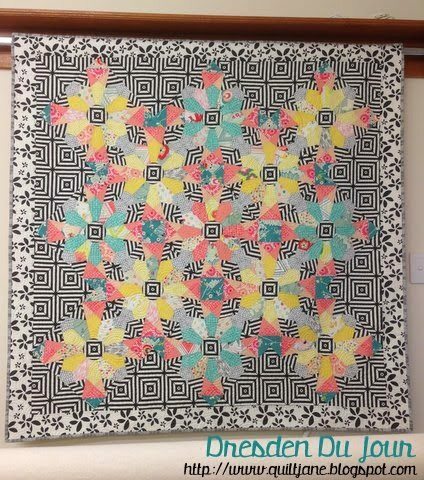 I have enjoyed making this quilt using paper piecing to make the Dresdens surrounded by a very busy backdrop. I wanted the background to have an impact. It’s amazing the effects that can be achieved by using large, geometric prints in the background. All the fabrics used in this quilt are from Pat Bravo and Art Gallery Fabrics. The Dresdens are a combination of Rapture, Pure Elements and Squared Elements. The background, border and binding are from the Minimalista collection. Quilted with a dense circular pattern using Aurifil 2105 50wt cotton. It was the closest thread colour I had to pale lemon. This quilt will be making its way to Spring market to the Art Gallery Fabrics booth along with others. Bon Voyage my little quilt. Enjoy Pittsburg and I hope you make it home one day. In June Di Mill, our lovely Fabric rep, is having a Patchwork Retailers Convention and Trade Show. 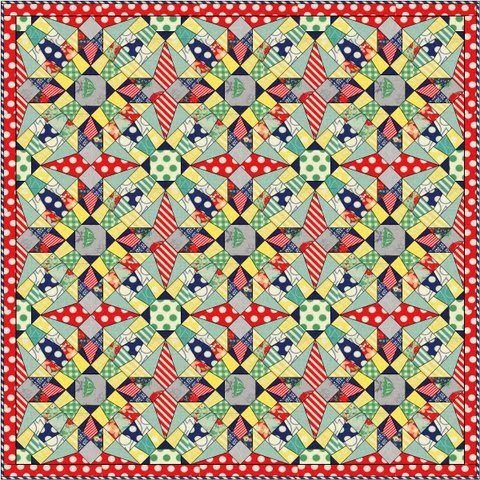 I will be making a couple of quilts for Di using Moda fabrics and conducting demonstrations of the Jaybird Rulers and how to use them for pattern making. We will be very lucky to have Camille Roskelley here in Australia for the trade show and lectures. 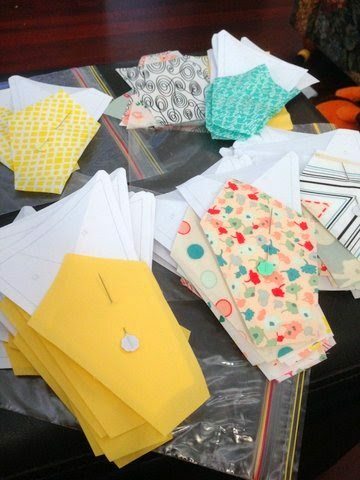 I am very excited indeed and plan to make a small quilt using the April Showers fabric sitting in my stash. I am not sure of the design yet but it may look something like this. 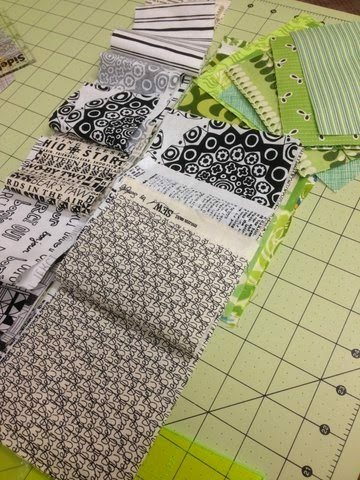 The March ModAusBee Block from Jess using the Migration Block by Charlotte Newland is waiting to be put together using these BW and text prints coupled with these luscious green prints. I do enjoy flying geese. Tonight I started on the Night Sky Quilt by Julie Herman of Jaybird Quilts. This will be part of a blog hop scheduled for 12th May 2014. I am using a combination of Metallic Tussah and Quilters Linen from Robert Kaufman as well as fussy cutting the bees from Timeless Treasures and Drift from Angela Walters for Art Gallery Fabrics. I am keeping it very neutral although I have the urge to throw a vibrant colour in the mix. I will see what inspires me as I piece. There are a few more secret squirrel projects I cannot presently divulge but I feel I am in dire need of minions or at least a clone. Do you ever wish for an army of helpers? 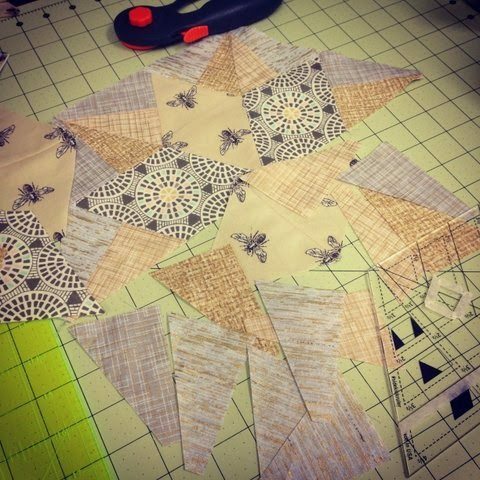 I have a question about the night sky blocks / quilt… are there Y seams?? I've been thinking about getting the pattern, but I'm a little intimidated. Nice. You have been busy. I thought I was busy but you blow me out of the water!! Love that first quilt so much!! You've been busy!!! I love your use of stripes in your quilts! And Yes! an army of minions would be a very handy addition to the sewing room! Oh yes – wouldn't minions be wonderful! Actually, a clone of you would be even better!! 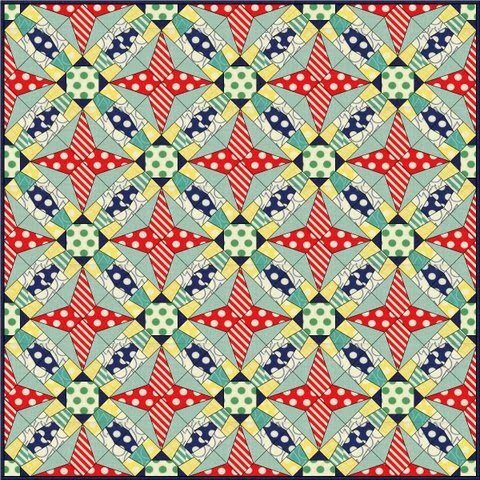 I love the April Showers range and look forward to seeing your quilt. Wow! Your Dresden Du Jour is beautiful. I love the effects you've achieved by mixing the graphic prints with small florals and solids. The next one looks like another winner!